At the fag end of May, Govt. issued an order which banned the sale of cows for slaughter houses, and restricted trading of cows. This has triggered unprecedented reactions and counter-reactions, which will be remembered in the history as cow backlash. While cow traders are now choosing online marketplaces for trading cows, in the fear of cow vigilantes, and the law; a co-founder of a hugely popular online travel portal had to eat his own words, and quit Twitter after his insensitive remark triggered a massive backlash. On May 31, Govt. passed an order which severely restricts cow trade, and bans the sale of cows meant for the slaughter house. Stopping sale of beef has been an ongoing agenda for the Govt., and the recent order can be described as part of that. However, the business of beef is a serious business, and the traders making money from this have now gone online. As per reports published in some mainstream newspapers, it was reported that trade of cows is now booming in online marketplaces, where the buyer and the seller can communicate discreetly, and carry over the business. Govt. has strictly stated that the sale and purchase of cows need to be done only for agricultural purposes, and this has generated panic among those traders who had earlier bought cows for selling them to slaughterhouses. Although the order was passed under Prevention of Cruelty to Animals (PCA) Act of 1960, Madras High Court had stayed the execution of this ban, and the matter is now sub judice. 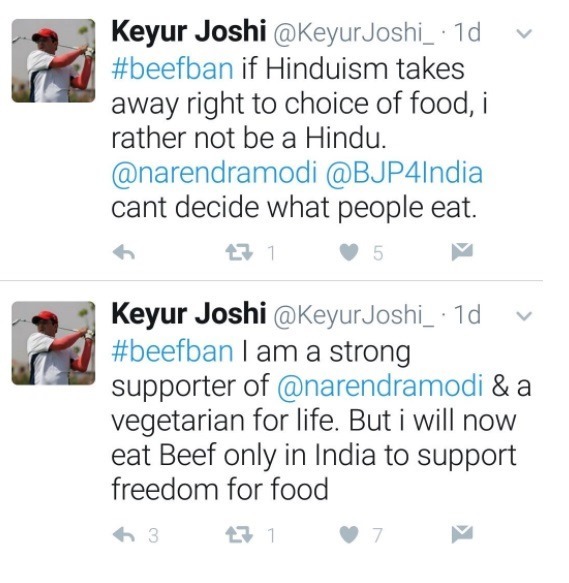 Meanwhile, Keyur Joshi, who along with Deep Kalra, Rajesh Magow and Sachin Bhatia had co-founded MakeMyTrip in 2000, had to face extreme anger and backlash on social media after his insensitive tweets on the ongoing beef issue. He was the Chief Commercial Officer in MakeMyTrip and had quit the company in 2015. These tweets touched a raw nerve of those who consider cows as their mother, and soon angry, hatred filled responses started to hit him. In fact, MakeMyTrip had to face a Snapdeal like situation, and users started uninstalling the app and started giving one-star reviews on the app stores. 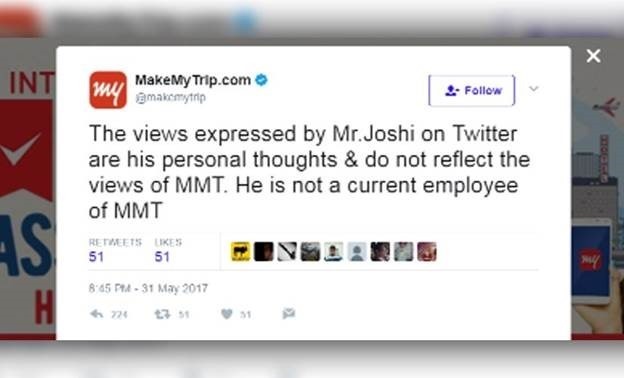 Later, MakeMyTrip had to issue a statement wherein they said that they have no links with Keyur anymore, and those were his own personal views. 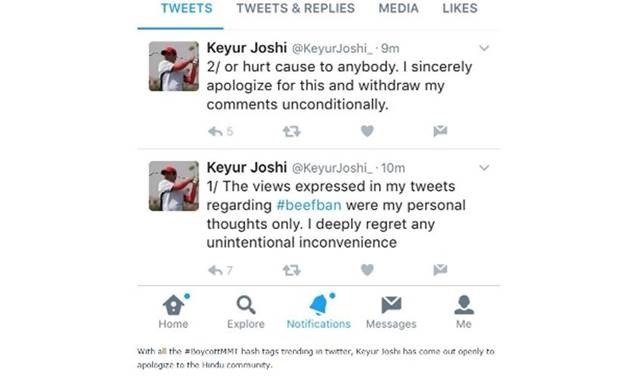 Keyur had to issue an unconditional apology before he quit Twitter. Do let us know your opinions by commenting right here. 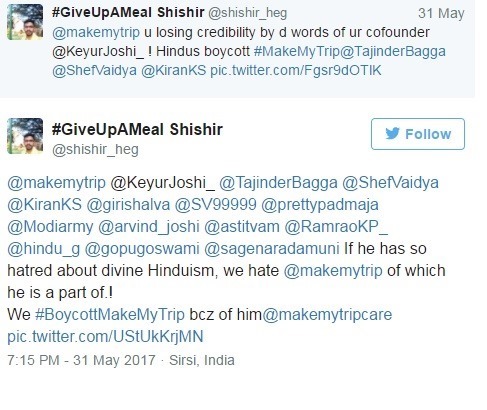 "Cows Now Being Sold Online After Govt Ban; MakeMyTrip Cofounder Bashed For Insensitive Remark On Beef", 5 out of 5 based on 4 ratings.